Emily Hong is a Seoul-born and New York-raised feminist anthropologist and filmmaker. Emily has directed several collaborative short films including Get By (2014), Nobel Nok Dah (2015), and For My Art (2016), which have explored issues of solidarity and labor, womanhood and identity in the refugee experience, and the gendered spectatorship of performance art. 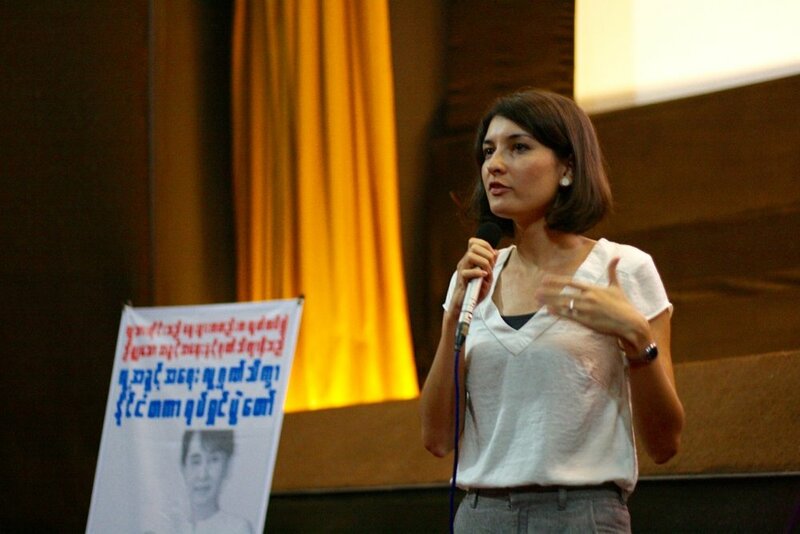 Her research, media projects, and activist engagements are largely rooted in Thailand and Burma, where she has spent a decade, first as a human rights campaigner and trainer, and later as a filmmaker and researcher. Emily’s films and video installations have been screened in Athens, Chiang Mai, Lisbon, Los Angeles, New York, Paris and Yangon. An active facilitator and trainer, Emily has ten years of experience conducting workshops for activists and social movement organizations on cultural resistance, video production, and movement-building. Maggie Lemere is a filmmaker, oral historian and storytelling and social change strategist whose projects focus on social and environmental issues. She has worked across the U.S., Africa, Asia, Latin America and Europe as a storyteller, refugee advocate and human rights and storytelling trainer. She is the editor of Nowhere to Be Home: Narratives from Burma's Military Regime (McSweeney's and Voice of Witness, 2011; NDSP Books, 2016), a Public Historian for the Washington DC Oral History Collaborative, and a leader of “Storytelling for Changemakers” with Ashoka: Innovators for the Public. Her storytelling clients include the Smithsonian Institution's National Museum of Natural History and Georgetown University’s Institute for Women, Peace and Security. Her film with GoodFight Media, Everyone a Changemaker: The Story of Pinelands North, won the Rockefeller Foundation's international Storytelling Challenge award in 2015. Maggie is passionate about expanding representation and voice in film, and creating high-quality and high-impact collaborative filmmaking projects. She received her Masters in International Peace and Conflict Resolution from American University. Arianna Schindle is an educator, organizer, and healer whose projects focus on building the capacities for resilience and resistance of communities and social movements. Arianna has worked in a variety of settings across the U.S., Asia, and Central America ranging from urban public schools, mental health clinics, nonprofit organizations, worker’s centers and labor unions, to private and public foundations. Arianna has more than 10 years of experience as a facilitator conducting workshops on the trauma of oppression, community organizing, and creative campaigning. She has spent many years consulting and supporting non-profits to develop integrative leadership development and peer support models, as well as addressing how systemic power impacts their values and purpose. As a healer, she has worked with individuals and communities struggling from the impacts of interpersonal and structural violence, displacement, and racial injustice. Arianna works on liberation from the inside out - building grassroots leaders, creating democratic organizational structures, developing transformative pedagogy, and fostering connections across organizations and movements. Arianna received her graduate certificates in urban public health and clinical social work at Hunter College. Zoë West is a researcher, educator and oral historian whose work centers on labor organizing, immigration, and human rights. She positions herself at the intersection of grassroots and academic work, rooted in the commitment to helping social movements use research and documentation to fuel and strengthen their work. In this vein, she also works actively in teaching and training across various spaces, and supporting groups in building power through creative strategy, deeper internal processes, and organizing across movements and identities. Zoë co-edited and compiled (with fellow Rhiza member Maggie Lemere) the oral history collection Nowhere to Be Home: Narratives from Survivors of Burma’s Military Regime (McSweeney’s/Voice of Witness, 2011; NDSP Books, 2016), which was recently published in Burmese. Zoë received her PhD in social anthropology from the University of Oxford. Our website features the photography of Jeannie Holden, Emily Hong, Maggie Lemere, and Mariangela Mihai.